The name sounds…exotic and Nissan’s take on what an edgy, urban thinking Nissan Maxima was by all accounts a massive success. So much so that Nissan is not only bringing back the provocatively named optional trim, they are releasing it across most of their line. So what does a “Midnight Edition” entail? Nissan’s Midnight Edition is an exclusive equipment package that not only adds visual excitements with black wheels, black spoiler, black mirror caps and available special floor mats but also a new pricing setup for performance equipment. Initially this was only available for the Maxima SR and the trim meant the car was class in a glossy black finish. Now that the trim has expanded, the color options have changes as well. The high-optimized pricing of this edition , with the packages’ MSRPs1 offer special discounts up to $1,300 on select models (versus similar equipment priced separately). This is available for both 2017 Sentra SR and SR Turbo models. It comes with aluminum-alloy wheels, black mirror caps, black rear spoiler and available Midnight Edition floor mats. In terms of color you get Red Alert, Super Black, Aspen White and Gun Metallic models. The package cots an extra MSRP of $490. This one is only available for the Altima 2.5SR iSuper Black, Gun Metallic, Pearl White and Cayenne Red models. And for this you get black 18-inch Midnight Edition aluminum-alloy wheels and low-profile 235/45R18 all-season tires, black mirror caps, black rear spoiler, LED headlights. What’s really cool is that it comes with a remote engine start exclusive to the trim. This package will set you back an extra MSRP1 of $990. Back in black. The Maxima SR is the only car here that’s outright sporty even before the trim upgrade. You still get the black 19-inch Midnight Black aluminum-alloy wheels, the black rear spoiler, and Midnight Edition floor mats. BUT you also get a rear diffuser for better performance. This package a $1,195 USD upgrade. The Rogue is Nissan’s best-selling nameplate and it’s Midnight Edition is no slouch. The black 17-inch Midnight Edition aluminum-alloy wheels, black mirror caps and available Midnight Edition floor mats all come with it. What is exclusive to the Rogue are the black roof rails, black cross bars, black splash guards, rear bumper protector and illuminated kick plates. This trim will come in Magnetic Black, Gun Metallic, Pearl White and Palatial Ruby. The Midnight Edition Rogue package will be a $990 USD add-on. Similar to the Rogue, the 2017Murano Special Edition is mostly a visual upgrade. It’s still Platinum grade though and it has exclusive black 20-inch Midnight Edition aluminum-alloy wheels in addition to new black roof rails, black mirror caps, black splash guards and available of course exclusive floor mats. This trim comes in Pearl White, Cayenne Red, Gun Metallic and Magnetic Black. Opting for this means you spend an additional $1,195 USD. The Pathfinder SUV gets the Midnight Edition treatment with exclusive 20-inch aluminum-alloy wheels, black mirror caps, black spoiler, black splash guards, illuminated kick plates, chrome rear bumper protector and available Midnight Edition floor mats. This one also comes in Pearl White, Cayenne Red, Gun Metallic and Magnetic Black. This will cost you an extra $1,195 USD. So there you have it! 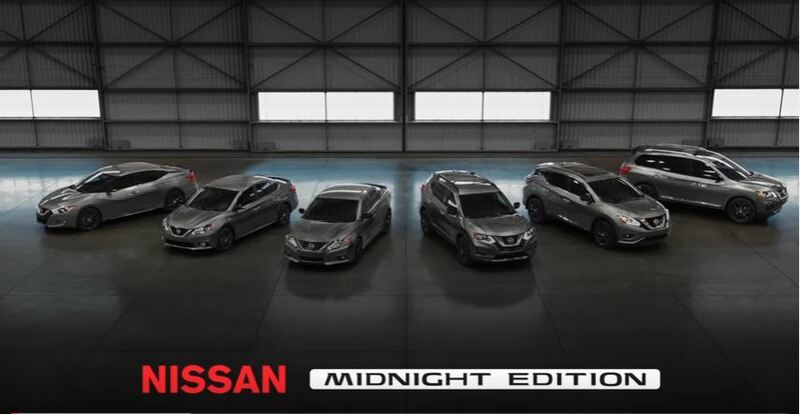 Nissan not only bringing back the top selling Midnight edition trim, but applying it to all their top selling vehicles. Which one is your favorite? Comment below and let us know! Feel free to share your favorite vehicle trim you’d like to see return to dealerships too!